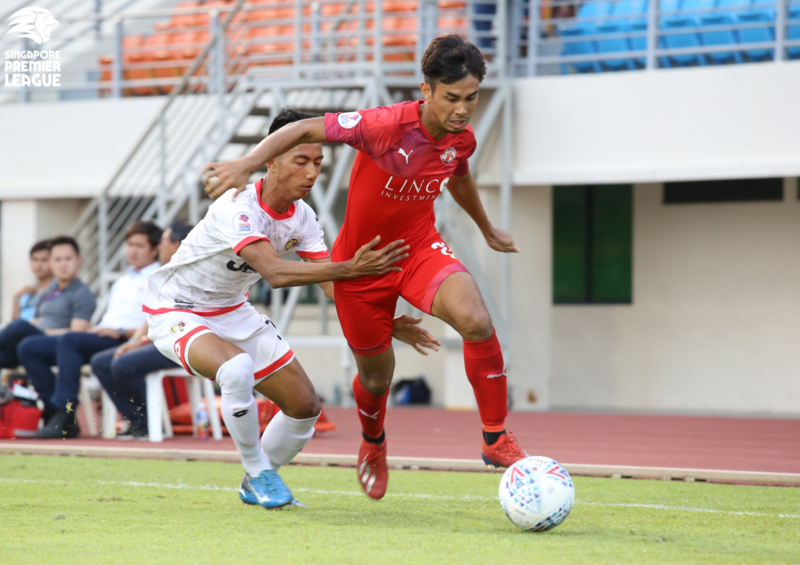 The defending champions’ stuttering start to the season dragged on as they failed to overcome a DPMM side that ended with ten men after Najib Tarif received a second booking on 53 minutes. Wardun Yussof made a smart save off a free-kick and the White Swans spurned a few opportunities from good positions, though they did pick up their first point of the campaign. – Albirex extended their unbeaten run at Jurong East to 41 games in all competitions. – Albirex failed to score in two successive games in all competitions since March 2016 – a run of 93 matches. – DPMM is the only team yet to concede in the league this season (3 games). – Wardun has helped DPMM keep three consecutive clean sheets in the SPL for the first time in their history. Albirex: Kengo Fukudome (GK), Shuhei Sasahara, Naruki Takahashi, Kodai Sumikawa, Zamani Zamri (Sota Sugiyama 46′), Kaishu Yamazaki, Ryo Nakano, Kyoga Nakamura (C), Daniel Martens (Makito Hatanaka 64′ (Yoshikatsu Hiraga 90’+1)), Daizo Horikoshi, Hiroyoshi Kamata. Unused subs: Hyrulnizam Juma’at (GK), Gerald Ang, Firas Irwan, Daichi Tanabe. 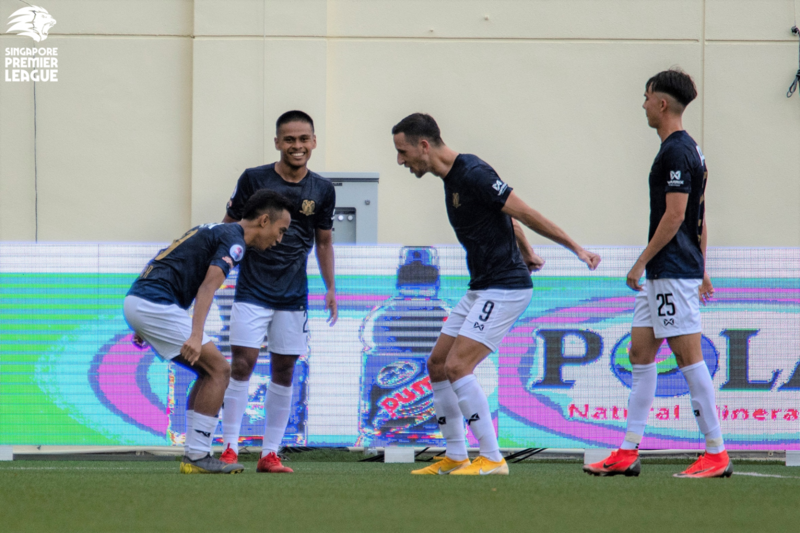 DPMM: Wardun Yussof (GK) (C), Hazwan Hamzah (Abdul Mu’iz Sisa 81′), Charlie Clough, Yura Indera Putera, Awangku Fakharrazi, Hendra Azam (Shah Razen Said 67′), Blake Ricciuto, Najib Tarif, Azwan Ali Rahman, Abdul Azizi Rahman (Razimee Ramlli 76′), Andrei Varankou. Unused subs: Haimie Nyaring (GK), Azwan Salleh, Helmi Zambin, Wafi Amunuddin. Early pace-setters Tampines made it three wins out of three to stay top of the table, though Geylang proved to be stiff opposition. The Eastern derby was decided by a sole goal courtesy of Khairul Amri, who curled a neat finish into the bottom right corner after Jordan Webb had won the ball near the halfway line and slalomed to the edge of the box before playing in the Singapore international for his first goal of the season. A couple of good saves from Zainol Gulam kept the Eagles in the game and they could have stole a point towards the end had Amy Recha not dragged his finish wide. – Tampines kept their first clean sheet of the season and first in nine games. – Tampines have now won five consecutive derbies against Geylang. – Webb made his third assist in as many league games this season. – Amri has now scored for Tampines in each of the last three matches they have played against Geylang at Our Tampines Hub. Geylang: Zainol Gulam (GK), Jufri Taha (C), Shahrin Saberin, Darren Teh, Mohd Noor Ariff (Fareez Farhan 46′), Firdaus Kasman, Syahiran Miswan (Azri Suhaili 78′), Yuki Ichikawa, Barry Maguire, Christopher van Huizen, Zikos Chua (Amy Recha 46′). Unused subs: Hairul Syirhan (GK), Umar Akhbar. Tampines: Syazwan Buhari (GK), Madhu Mohana, Amirul Adli, Daniel Bennett, Hamizan Hisham (Irwan Shah 46′), Shahdan Sulaiman (C), Shah Shahiran, Yasir Hanapi (Zehrudin Mehmedović 77′), Ryutaro Megumi, Jordan Webb, Khairul Amri (Taufik Suparno 62′). Unused subs: Zulfairuuz Rudy (GK), Akmal Azman, Zulfadhmi Suzliman, Joel Chew. A five-star showing from the Cheetahs saw them cruise to victory over nine-time champions Warriors, who were playing their first league game of the season. Having got their first league victory last week against Balestier Khalsa, Clement Teo’s charges went for the kill from the start and got the breakthrough when Faris Ramli was fouled in the box. Stipe Plazibat coolly tucked away the spot-kick and added his second of the season two minutes later by bundling in the rebound after his initial effort was thwarted by Shahul Rayyan. The Warriors goalkeeper had a moment to forget when his attempted dribble past Faris saw the Singapore international pick his pocket to score. Amir Zalani cracked home a fine volley, before Hafiz Sujad crossed for fellow substitute Fazrul Nawaz to make it five. Fairoz Hasan got a debut goal late on to pull one back for Warriors, who dropped to the bottom of the table. – Hougang scored five goals in a game for the first time since April 2011. 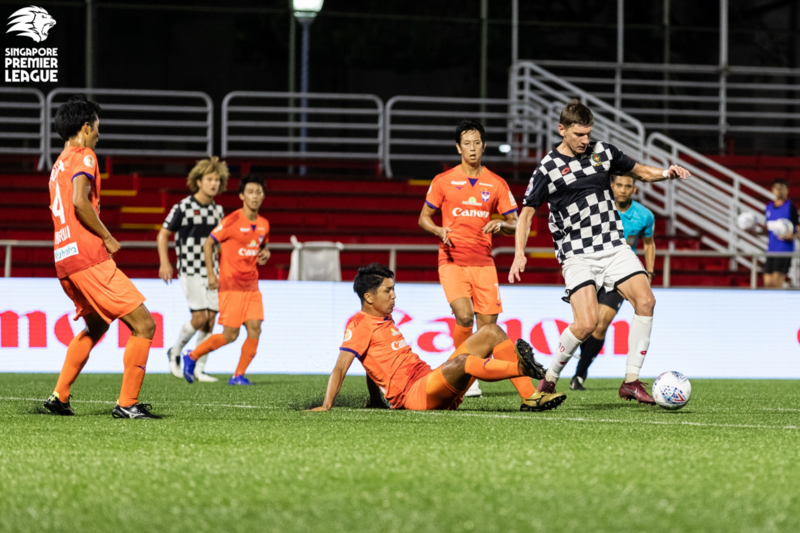 – Hougang won two consecutive matches for the first time since October 2017. 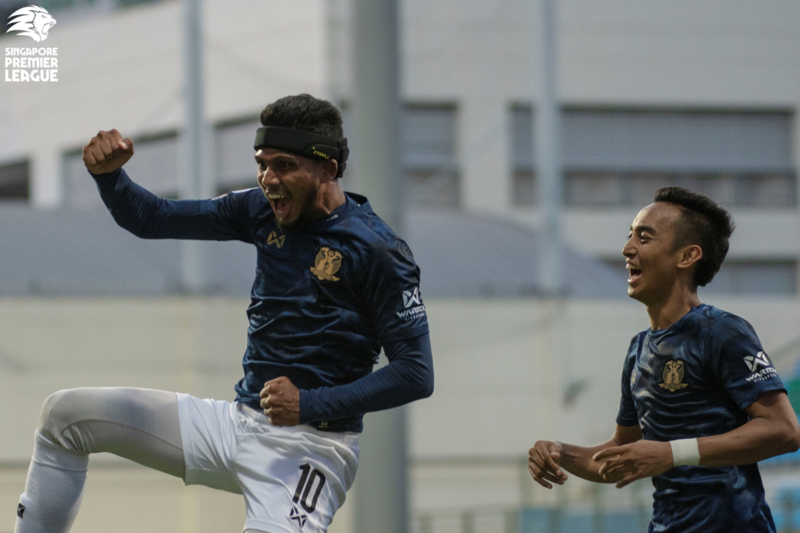 – Faris became the first Hougang player to score in three consecutive matches since Fumiya Kogure did so in March 2017. – Faris and Plazibat are the first pair of players to have scored from each other’s assist this season. Hougang: Ridhuan Barudin (GK), Nazrul Nazari, Afiq Yunos, Kong Howon, Jordan Vestering, Timothy Yeo (Fazrul Nawaz 46′), Zulfahmi Arifin (C), Amir Zalani (M. Anumanthan 62′), Afiq Noor (Hafiz Sujad 73′), Faris Ramli, Stipe Plazibat. Unused subs: Khairulhin Khalid (GK), Alif Iskandar, Iqbal Hussein, Muhaimin Suhaimi. Warriors: Shahul Rayyan (GK), Ryhan Stewart, Tajeli Salamat, Kento Fukuda, Shameer Aziq, Gabriel Quak, Poh Yi Feng, Aarish Kumar (Fairoz Hasan 46′), Ifat Sha’aban (Jonathan Behe 46′), Sahil Suhaimi, Khairul Nizam (C) (Ignatius Ang 69′). Unused subs: Fashah Iskandar (GK), Yeo Hai Ngee, Emmeric Ong, Faizal Raffi. 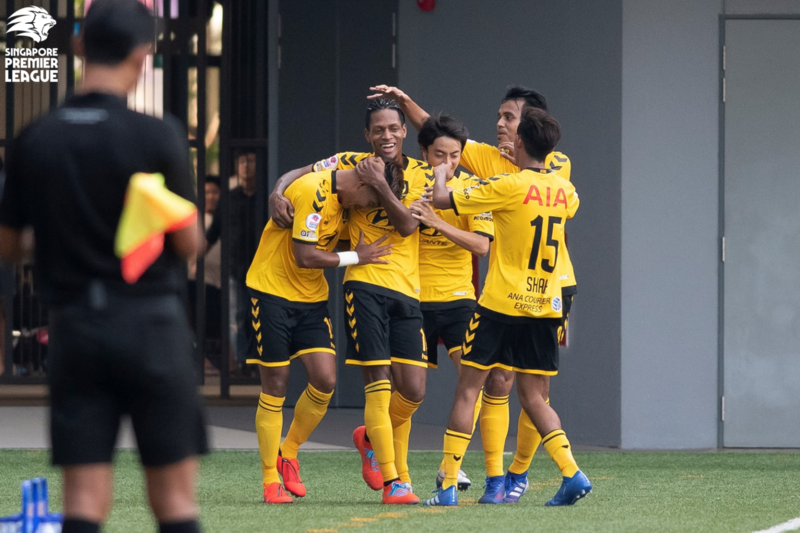 With the absence of six key players, including Song Ui-young and Hami Syahin, the Protectors failed to break down a stout Balestier side as their win-less start to the season continued. The Tigers were looking to bounce back from last week’s defeat to Hougang and had the better chances, but failed to capitalise and were foiled by a good stop from Nazri Sabri late on as they pushed for victory. – This was the second goal-less game of the season; there were only three 0-0 score-lines in the entire 2018 season. – Home failed to score in two consecutive home matches for the first time since May 2015. – Home kept a clean sheet for the first time in 22 games; Nazri kept his first clean sheet in 13 games, the last coming in 2012. – The last goal-less meeting between these two teams occurred 26 games ago in February 2012. Home: Nazri Sabri (GK), Faritz Hameed, Juma’at Jantan, Faizal Roslan, Ho Wai Loon, Izzdin Shafiq (C), Isaka Cernak, Hafiz Nor, Adam Swandi, Iqram Rifqi (Shahril Ishak 61′), Muhelmy Suhaimi (Nur Hizami 78′). Unused subs: Haikal Hasnol (GK), Abdil Qaiyyim, Aqhari Abdullah, Sheikh Faris, Anaqi Ismit. Balestier: Zaiful Nizam (GK)(C), Fadli Kamis, Illyas Lee, Khalili Khalif, Ahmad Syahir, Raihan Rahman, Huzaifah Aziz, Daniel Goh, Hazzuwan Halim, Goh Yi Qi (Sanjin Vrebac 72′), Kristijan Krajček. Unused subs: Faris Danial (GK), Sufianto Salleh, Fariz Faizal, Fazli Shafie, Akbar Shah, Sameer Alassane.